While J. went to work, I kept myself busy. 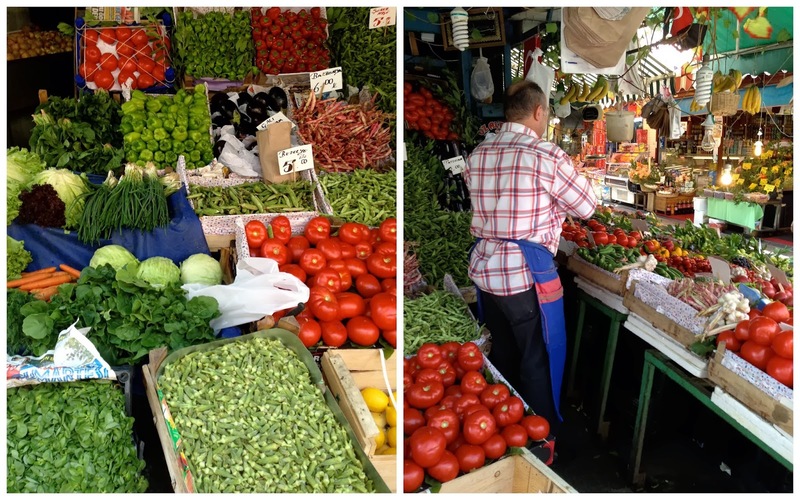 I'd never been to Istanbul and I had a lot to cover in a short period of time. 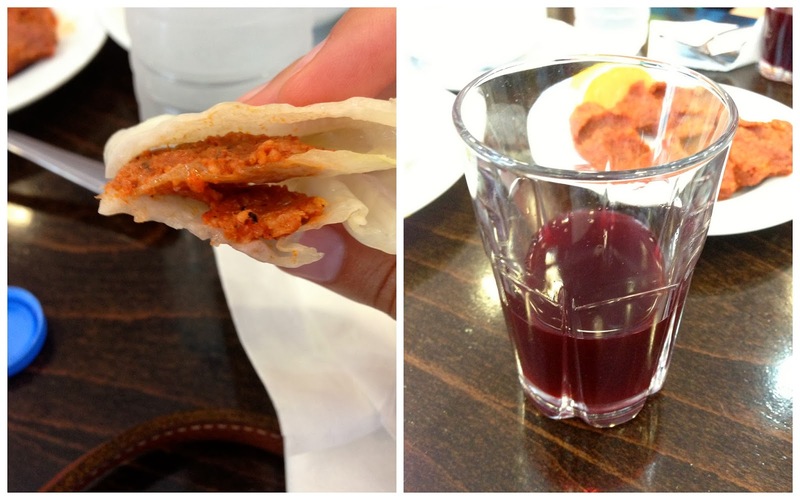 First stop: a food tour with Istanbul Eats. It kicked off with tea outside an esnaf lokanta (tradesman restaurant). We stood in a leafy, crumbling courtyard, sipping tea and watching an older man feed some straggly cats a dish of milk. He jokingly informed us that the cats weren't fasting (it was Ramadan) and neither was he. My love affair with Turkish food starts with breakfast. The food tour did not disappoint, taking us to another family-run lokanta, for a full-on Turkish breakfast. While not photographically-appealing, kaymak, thick buffalo-milk clotted cream, is a life-changing experience. I was so in love with this stuff, I even bought some before I left Istanbul, which I enjoyed on my flight to Lisbon. As decadent as the kaymak was, we had more to try. Housemade jams, including rose, went perfectly with the cream and pastries. The restaurant's owner brought over a hot pan to the table and scooped spoonfuls of fluffy menemen (an egg dish) onto our already full plates. "Pace yourself," I told myself, without heeding my advice. Following our breakfast, we took the ferry to the Asian side for lunch at Çiya. The restaurant specialized in Ottoman cuisine- this meant lots of fruits and nuts incorporated into dishes, as well as stuffing and drying techniques. Here we enjoyed a plate of stuffed peppers. 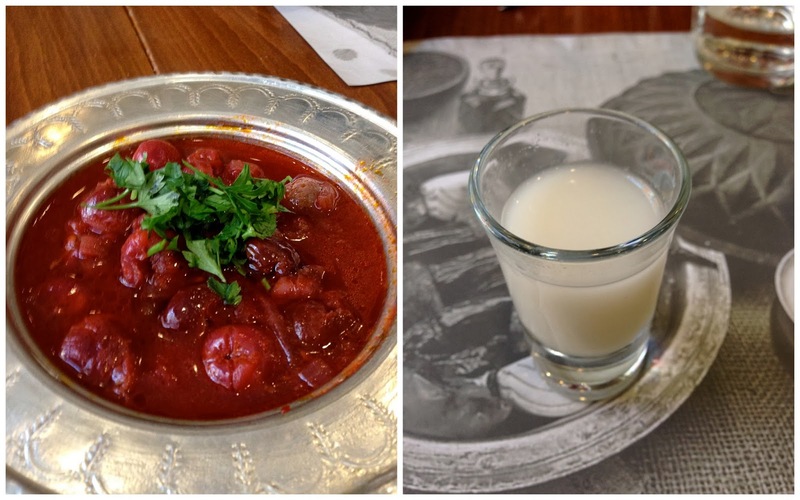 Still at Çiya, we tasted meatballs steeped in tangy cherry sauce (left) and sipped on Subye, a watermelon seed drink (right). Lunch had to be followed by one of the best desserts of my life: sobiyet baklawa w/kaymak. This small pastry shop takes baklawa to another level, invigorating the often overly dry and cloyingly sweet pastry into perfection. 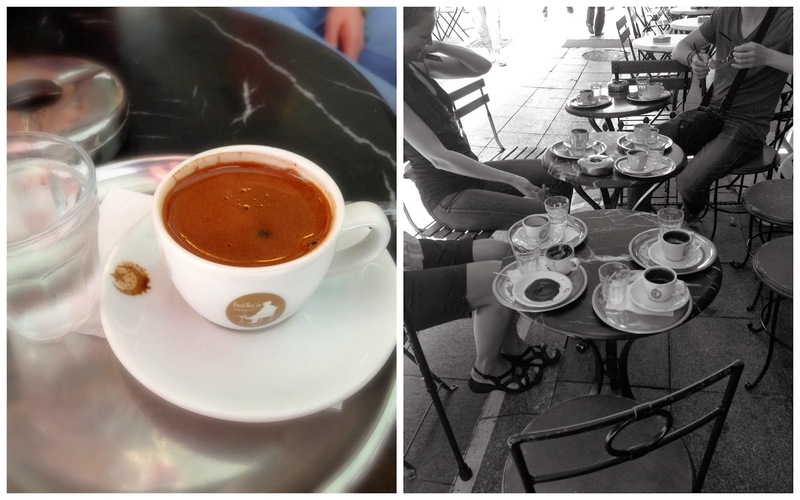 Kaymak-filled baklawa needed to be followed by coffee so we took a caffeine break down the street. 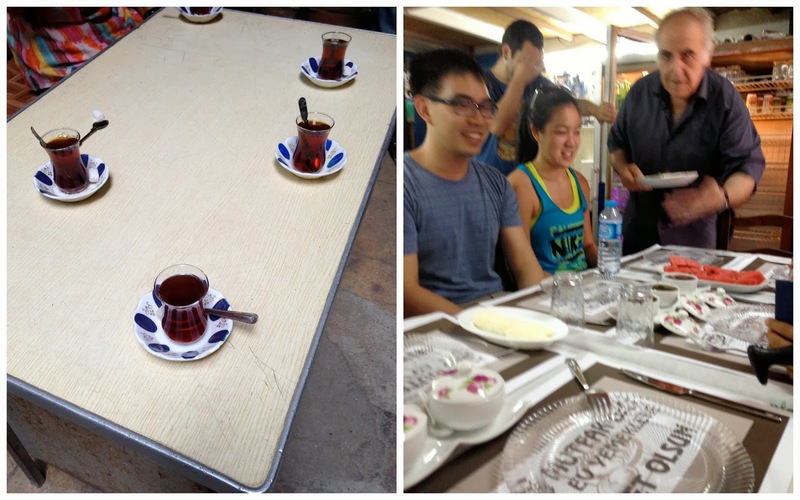 We learned that nothing goes in Turkish coffee once it's ready (no sugar, etc. can be added after). 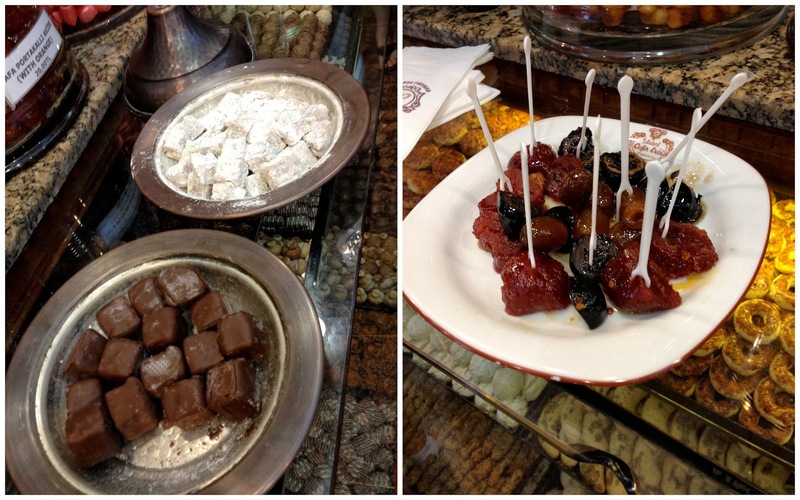 After filling up on strong Turkish coffee, I got to be a kid in a (Turkish) candy store. Not just any candy shop but a 203-year-old store filled with both familiar and unusual "desserts." Even though we had just had lunch, it was time for a tantuni break. Tantuni come from the southern part of the country and are wraps filled with delicious meat and veggies. Frothy, bubbly ayran on tap was just the thing to wash down these rolls with. Our last stop of the day was at Kimyon, located in an interesting neighborhood. We tried a lot of different dishes here, some mouthwateringly satisfying (like this acidic turnip juice) and others that didn't quite win me over (like the pale soup below). I enjoyed Kimyon's take on Künefe: shredded wheat, goat cheese, and pistachio topped with kaymak. But the winner was this katmer (which our guide brought back from a nearby pastry shop): stuffed with? That's right, kaymak. Are you sensing a pattern here? Kaymak makes everything better. The tour ended on such a high note, as we went our separate ways in Istanbul. Which of their 3 tours was this one? It was the Two Markets Two Continents walk. Highly recommended!